Warsaw has sent a note of protest to Kiev after a monument to Poles killed in a massacre by a Ukrainian Nazi division during World War II was vandalized in western Ukraine. A cross made of stone was blown up, while two tables with the names of the Poles killed in the 1944 massacre were damaged. Investigators have been working at the site, Regnum news agency reported, saying that the authorities were trying to establish the type of explosives used to destroy the monument. A video of the damaged historic site has emerged online. Parts of the monument had been painted with signs commonly used by modern Ukrainian nationalist groups, Regnum said. Blue and yellow paint – in apparent reference to the Ukrainian flag – can be seen on the monument, while another part of it, with the names of the massacre victims, had been painted in the colors of the flag of the Ukrainian Insurgent Army (UPA). The letters ‘SS’ had also been written on it, seemingly in reference to the Waffen-SS, a Nazi wing of foreign fighters during World War II. The Polish Foreign Ministry has condemned the attack on the monument. In a statement published on its website, it called for an "immediate" investigation, saying those behind it must be punished, TASS reported. Incidents like this threaten relations between the two nations, the statement added. A note of protest had been sent to Ukraine's Foreign Ministry, Poland’s Wyborcza newspaper cited Polish Ambassador to Ukraine Jan Pieklo as saying. The monument in the now non-existent village of Huta Pieniacka in Lvov region in western Ukraine was erected in memory of the hundreds of people who lived in the then Polish village and were brutally killed in 1944 by a Ukrainian SS division. In the massacre, the whole village of up to 900 people was destroyed, with residents burnt to death in their homes and inside a local Catholic church. The site has never been repopulated. Warsaw considers the Huta Pieniacka massacre to be one of the greatest crimes committed by Ukrainian nationalists in Eastern Galicia – the now border region between Poland and Ukraine. 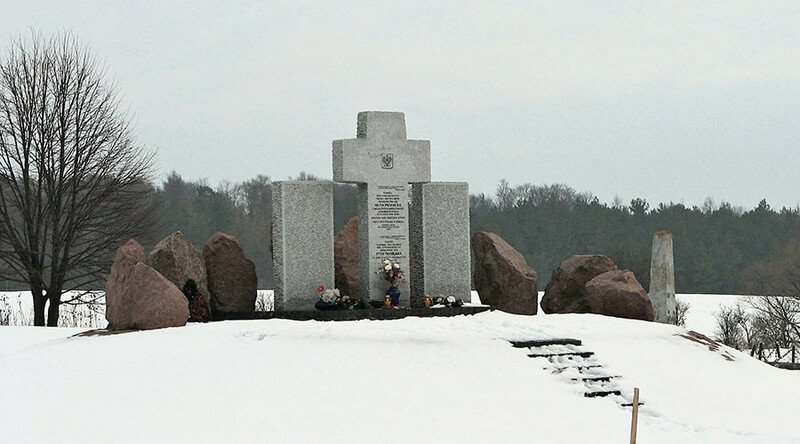 In 2009, the then presidents of the two countries, Lech Kaczynski and Viktor Yushchenko respectively, visited the site to pay tribute to the victims, according to the Polish media. Last year, the Polish government adopted a resolution labeling crimes committed by Ukrainian nationalists against the Poles in World War II as genocide. According to the document, massacres of more than 100,000 citizens, "mostly peasants," were committed by OUN-UPA (Organization of Ukrainian Nationalists – Ukrainian Insurgent Army) in 1943-1945. The resolution was initially condemned by Kiev, which called it a "politicization of history." Ukraine then agreed to intensify joint historical research with Poland. Meanwhile, in October last year, one of the leaders of the Ukrainian nationalist movement, Dmitry Korchinsky, openly called for the destruction of all Polish monuments – as well as Soviet ones – on the territory of Ukraine, according to Regnum.